Possibly my favorite outgroup material, pictured here is Claytonia rubra, a widespread annual species that is a close relative of the group of tuberous perennials that I study. This species has been involved in a number of ’bouts’ of hybridization primarily with two other annual Claytonia (C. perfoliata and C. parviflora), making the identification of annual species in this group incredibly challenging. Polyploid lineages have been recognized as varieties for this species and others formerly treated as C. perfoliata sensu lato, creating what appears like a continuum of morphological variation in one ‘species’ resulting from recombination among three unique lineages (pictured below). Why do they call it Claytonia rubra? Well, because it is REALLY RED on the abaxial side (bottom) of the leaves, a condition resulting from increased betalain production, aside from its darker green adaxial surfaces as seen in the first picture. 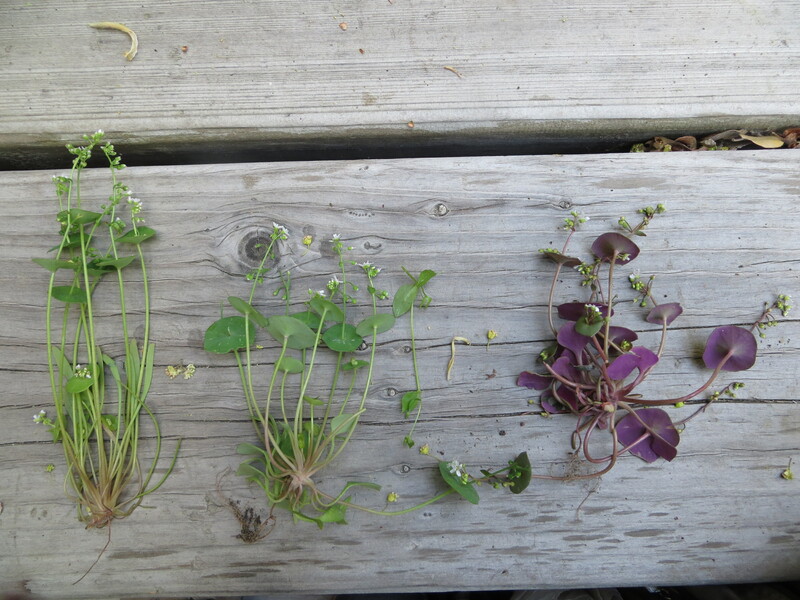 Claytonia parviflora (left) with linear leaves and C. perfoliata (middle) with spatulate leaves are readily distinguished from C. rubra by this morphological character alone, but subtle floral features exist as well that can be used for this group, including petal shape. 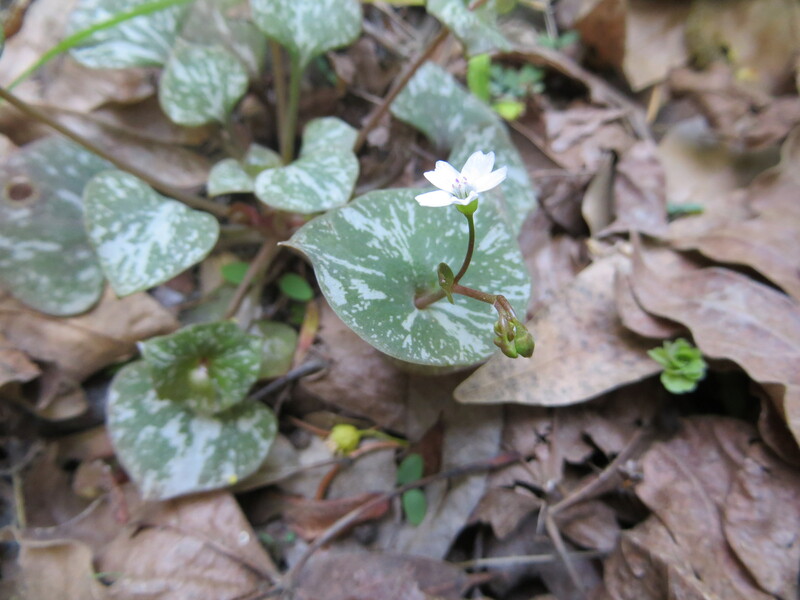 Next spring, when you’re out hunting for melting patches of snow to see the pretty Claytonia that are in bloom next to them, be on the look out for ‘miner’s lettuce’ at slightly lower elevations than the tuberous perennials but still in areas of high moisture. Claytonia rubra is typically found in Mixed Conifer habitats, often in deep shade and at higher elevations than other members of the C. perfoliata sensu lato complex. The C. perfoliata sensu lato complex (including C. rubra) is incredibly ruderal and can be found nearly anywhere in the montane habitats of California and the Southwest, making my choice to study the tuberous perennials seem a bit silly at times. Polyploidy seems to be intimately linked with the successful dispersal into new and disturbed habitats in this group, and it will be interesting to compare with the evolutionary patterns and relationships among the tuberous perennial Claytonia. 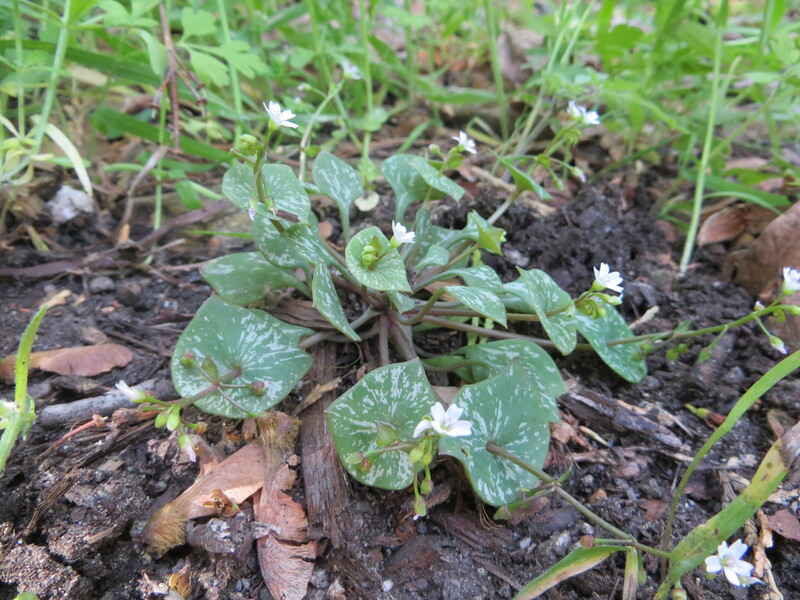 This entry was posted in Claytonia lanceolata species complex and tagged allopolyploidy, Betalain, california, claytonia, Claytonia perfoliata, Claytonia rubra, Claytonia rubra subsp. depressa, Claytonia rubra subsp. rubra, hybridization, polyploidy, Speciation, Species complex, sympatric species, sympatry by tstou10. Bookmark the permalink. Cool! I remember C. perfoliata to be common in the city street cracks in San Francisco.